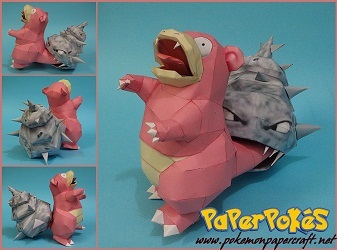 Slowbro is a bipedal pokémon that evolves when a Shellder bits it’s tail. Due to Shellder’s poison, Slowbro can’t feel pain. If Shelldon is knocked off, Slowbro will return to it’s previous stage. Despite being accepted that Shellder triggers the evolution, in the games it has nothing to do with evolving Slowpoke into Slowbro. It is capable of powerful psychic attacks, but it is peaceful and prefer not to fight. This entry was posted in Pokemon on 13/06/2015 by ToyXD.